Acharyashree Bhikshu Govt / ABG Hospital Delhi has advertised application for filling up the Junior Resident post on adhoc basis by walk in interview. ESIC MODEL HOSPITAL MIDC, ANDHERI-(E), MUMBAI-400 093. Visits required: 4 visits / month, with 3 hours OPD duties. Note: You should mention your desired remuneration per visit. Reference: Hindustan Times (Mumbai), dt.12/03/2015, page 19. Post QualificationNo. of PostJunior Consultant in Orthodontics 1. 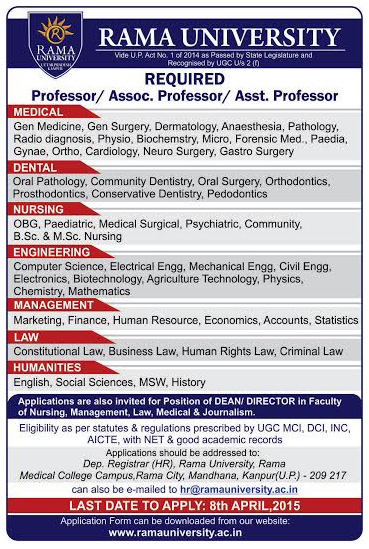 Post Graduate Degree (MDS) in Orthodontics from recognized University approved by the Dental Council of India. 2. State Dental Council Permanent Registration 04Name of districts : Thiruvananthapuram, Idukki, Ernakulam, Kannur Salary : Rs. 32,000/- Age : 50 years as on 01.03.2015. Examination Fee : Rs. 150/- (Rupees Two Hundred and fifty only). The amount should be deposited in the bank in Account no: 626201086917 with ICICI bank 4 in the name of "State Programme Manager(Admn&Training). The Receipt/Counter foil should be attached in the application when you are applying job in online portal.